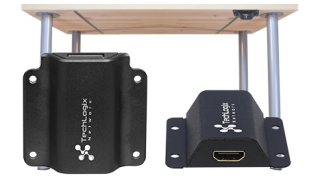 The What: The TechLogix TL-CPT-HD01 provides a low-profile HDMI connection point that mounts under tables, desks, podiums or any other flat surface. The What Else: Measuring 2 inches square, the TL-CPT-HD01 serves as a mountable inline HDMI repeater between table-top source devices, displays, and/or other HDMI electronics. It is powered by the 5V HDMI connection and supports HDMI 2.0/HDCP 2.2 signals. Dual female HDMI connectors allow for integration with cables from virtually any manufacturer. The Bottom Line: TechLogix Networx’s TL-CPT-HD01 is designed with collaboration work environments in mind, and provides a simple tool to clean up rooms and streamline presentations. Retail price for the TL-CPT-HD01 is $49.99.